Published every day, seven days/week at 6:00 AM (Central). Archived copies can be accessed from the calendar on the "Headlines" page. You may also subscribe to receive e-mail notices daily when the latest edition is published. Bona fide members (legitimate licensees) of the MG Taylor ValueWeb may submit news, event or opinion items for inclusion in the publication by sending items for consideration to theeditor. The MG Taylor ValueWeb enterprise is composed of our core business units—which are wholly owned subsidiaries of MG Taylor Corporation, along with affiliated networks of external customers, producers and investors, and the systems integration function. The ValueWeb concept grew out of the "Business of Enterprise" Model developed by MG Taylor co-founder, Matt Taylor, in 1985. Between 1985 and 1995, the concept was developed more fully. Although from the beginning of MG Taylor's work in the mid-1970s, the network concept slowly evolved into the ValueWeb model which was matured by use, in the mid-1990s, with the Air Force. Complex ValueWeb structures are co-dependent on the PatchWorks process concept; conceived in 1997 and now developing into a standard practice. In 2001, the ValueWeb model was developed into an Operating System (OS). It is now a part of our patented System and Method. The ValueWeb concept, then, can be employed as a notional idea (model) or as a formal system (method). Most of what has passed for organization change has been, in fact, improvement of methods and processes associated with a default in-place organizational model that remains fundamentally unchallenged. This kind of work is important but provides limited leverage. 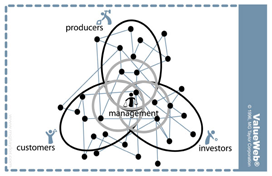 In organizations beyond startup scale, the hierarchical model remains dominant. This is about to change as complexity continues to overwhelm existing organizational architectures.